(Online Dating Industry Journal) Online Dating Magazine has updated it's demographics and advertiser information page to reflect 2010 stats. Online Dating Magazine has seen a strong growth in both unique visitors and page views. For 2010, Online Dating Magazine has more than 110,000 unique visitors a month and more than 500,000 page views per month. You can visit the advertising page here. > A 120x60 space at the top of all 2,000+ pages of Online Dating Magazine. Click here for details. > 300x250 space appearing on more than 1,400 content pages at the beginning of content articles. Click here for details. It is extremely rare for this space to be open. Online Dating Magazine today introduced four new ad slots that all appear near the top of the page, just above the menu and below the magazine title. The ad spaces are 120x60, above the fold, and appear on all 2,000 pages of the publication. This is the first time in more than six months that any Online Dating Magazine advertising space has been available. For six months straight, all advertising on Online Dating Magazine has been sold out and there are only two (of the four) new ad slots available. You can go to OnlineDatingMagazine.com to see the slots or visit this page for rates and information. (Online Dating Industry Journal) For advertisers looking to reach singles and online daters, October is going to be a big month for Online Dating Magazine. Today the magazine announced it is sponsoring a huge new study, called The Modern Love Study, that examines the factors that determine relationship satisfaction and whether couples who meet online have the same or better quality relationship when compared to couples who meet through more traditional methods. You can read the press release here. Online Dating Magazine is also sponsoring Online Dating Safety Awareness Month for October 2009 (look for more info tomorrow). Increased traffic from media attention for both events is expected to bring a much higher than normal number of singles and online daters to Online Dating Magazine. For more information on advertising, visit the Online Dating Magazine Advertising page or OnlineDatingAdvertising.com. (Online Dating Industry Journal) Today Online Dating Magazine unveiled a new look and focus for its Online Dating Advertising Website. The new site, at OnlineDatingAdvertising.com puts more of a focus on online dating advertising research and tips while still offering valuable banner advertising packages that appear on multiple online dating sites. As part of the launch, the site is offering 20% off on any of the available package plans if ordered by August 21, 2009. Once you book a package the 20% will be taken off of the total price before payment is made. Those taking advantage of the discount will also be grandfathered in at the discounted rate until they cancel. Three new areas on the Online Dating Advertising Website include Advertising Research, Advertising Tips, and Videos, which is currently showing the infamous Apple banner ad campaigns. You can now also follow Online Dating Advertising on Twitter (click here). (Online Dating Industry Journal) The Online Dating Magazine Ultimate Advertising Package is available for ads running beginning August 10, 2009. It's extremely rare that the package is available, so if you'd like to grab the spot, you can learn more here. 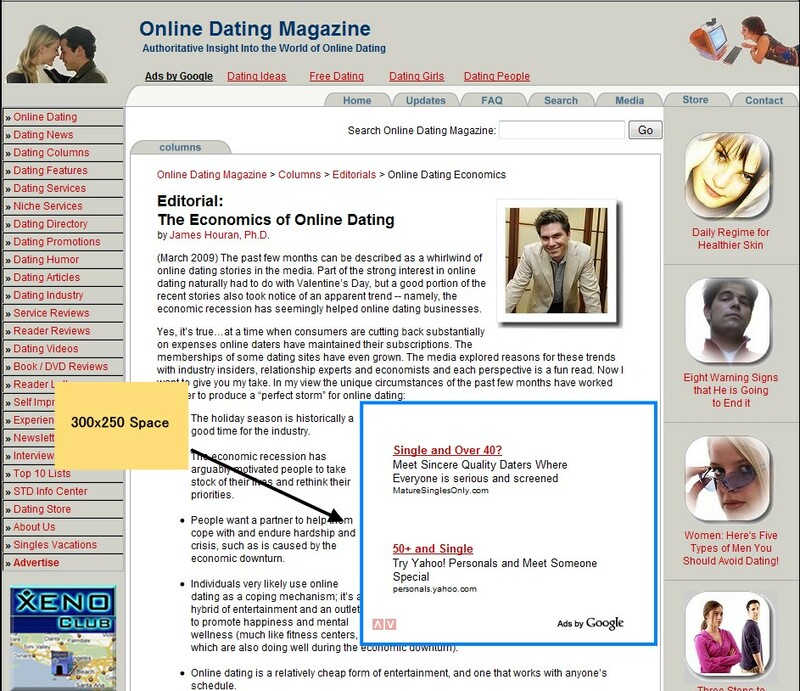 (Online Dating Industry Journal) Online Dating Magazine has one advertising space available for August and it's an ad space that is rarely available - the 300x250 space that appears on 1,400 article pages near the top right of every article. It's a very high profile space (see image example here). The cost for the space is $500 a month. Online Dating Magazine has more than 90,000 unique visitors a month with slightly more female visitors than male visitors. To book the ad space, email jtracy@onlinedatingmagazine.com and include a link to your Website for approval. Note: This ad space does not appear on the home page, cartoon pages, or video pages - only article pages - 1,400 of them. (Online Dating Industry Journal) The Online Dating Advertising site, which features ad space available for those targeting online daters and singles, has been updated to feature ad packages for July 2009. If your company targets online daters or singles you should be looking (and booking) the packages available. Note (5/13/09 5:01pm PST): The offer below has now expired and is no longer available. The next special offered by Online Dating Magazine won't be for at least six months. You can view regular advertising packages by visiting Online Dating Magazine's Advertising page or the Online Dating Advertising Website. (Online Dating Industry Journal - May 12) Only twice a year, Online Dating Magazine offers one-time advertising specials (this is the first for 2009). Here are two online dating advertising specials that are good if booked before 5pm PST on Wednesday, May 13. To book one of the below packages, contact jtracy@onlinedatingmagazine.com. » 120X600 skyscraper space on right hand side of all 1,600+ Online Dating Magazine pages (more than 90,000 unique visitors a month). » 300x250 ad on all pages of the Online Dating Newsletter (right side, above the fold). » Text ad (up to 200 characters) in the Online Dating Newsletter (four issues per month - your ad appears in all issues for the month). There are currently 1,700 people subscribed to the newsletter). » 120X60 space on right hand side of all DateLists.com pages. » 125x125 space on right hand side of all Online Dating News Blog pages (#1 position). » 125x125 space on left hand side of all Online Dating Commercial pages. To order this package, email jtracy@onlinedatingmagazine.com indicating that you want "Special Package #1". Include a link to the Website you will be promoting and the number of months (1 or 3) that you want to book the special for. Once your site is approved for advertising, you will be sent in-depth instructions on how to make the payment and where to send the creative. » 728X90 ad at the top of all 1,600+ Online Dating Magazine pages. » 728x90 ad at the top of all 700+ NEWSdial.com pages. » 468X60 ad at the top of all DateLists.com pages. » 468X60 ad at the top of all Online Dating News Blog pages. » 468X60 ad at the top of all Online Dating Bookmarks pages. » 468X60 ad at the top of all Online Dating Commercials pages. » 468X60 ad at the top of all Dating Handbook pages. » 468X60 ad at the top of all Online Dating Newsletter pages. » 468X60 ad at the top of all Online Dating Information pages. To order this package, email jtracy@onlinedatingmagazine.com indicating that you want "Special Package #2". Include a link to the Website you will be promoting and the number of months (1 or 3) that you want to book the special for. Once your site is approved for advertising, you will be sent in-depth instructions on how to make the payment and where to send the creative. This is the first of only two specials being offered in 2009. Be sure to take advantage of it before the deadline! (Online Dating Industry Journal) The Online Dating Newsletter, which launched three months ago and now has more than 1,000 subscribers, is now offering advertising in the form of a monthly sponsorship. The monthly sponsor gets an above the fold 250x300 ad space on all pages of the Website and a text ad in each issue of the Online Dating Newsletter. The newsletter is a weekly publication with dating tips, dating news, and online dating advice. Click here to learn more about the ad package. Online Dating Magazine is offering a new space. The publication is opening up its high-profile 300x250 space on article pages to advertisers. Previously the space was used strictly for Google Adsense. To learn more about the new Online Dating Magazine ad package, click here. Online Dating Magazine has more than 90,000 unique visitors a month and five regular weekly columnists.